The Kessil A360WE Tuna Blue LED aquarium fixture features a new and improved 90 watt LED array that is brighter than previous versions of the A360 fixture. The Tuna Blue uses the latest Kessil patented Dense Matrix LED array with a specially designed reflector system. Hot spots, common with many pendant fixtures, are eliminated with the A360WE. You can control the light spread using different lens options, too. This fixture uses Kessil Logic™ color blending technology that allows precise color blending. Other LED fixtures simply vary two color channels to adjust the spectrum. Kessel Logic™ uses two independent adjustments knobs. One knob adjusts the color spectrum and a second knob is used to control intensity. This same smart lighting system is used on professional photography lighting where precise control is critical. Kessil Logic™ allows for easier adjustment of the lighting system using just two knobs. You’ll be able to select and fine-tune the light spectrum because Kessil Logic™ allows each color channel to be independently tuned to create the best color spectrum to stimulate intense coloration and accelerated coral growth. Kessil also pre-programs the fixture to always provide the right UV spectrum for coral growth. The beautiful shimmer looks like natural sunlight penetrating the reef! Many reef hobbyists compare the shimmer to metal halide, free of any disco ball effect. It is a light often seen at frag swaps because it is quick to set up and really makes corals pop. The light can be hung above the aquarium as a single unit or in multiples that can be daisy chained for manual or automated programing and control. The updated control interface operates in the 0-10 V DC range and is compatible with a variety of aquarium controllers. The Kessil Spectral Controller is a popular and affordable option. A tank mounting arm system is available for a clean, professional installation. The Kessil A360WE is a great choice for reefers. The knobs on top make dialing in the right look easy. More advanced control is available if you connect the light to a controller, but you certainly don’t have to. Having the ability to connect multiple lights together is handy for large aquariums or if you intend to upgrade to a bigger tank down the road. 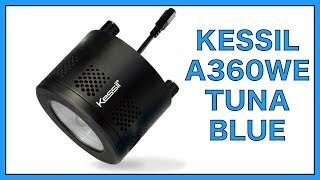 Kessil A360WE Tuna Blue - What’s in the Box? Had a Kessil 160 and upgraded for better PAR and Coverage. I had an easy time with affirm to help pay. I really wanted to like this light because it is a Kessil. The company is in my backyard, it is well made, looks good and gives good intensity. I did not find it pleasing to my eyes. I want to be able to adjust the wavelengths and it could not be done. The corals must be happy but so must eye. Perfect for my reef tank! Love the natural light look! need multiple units for SPS growth. Still building my tank so I can't say anything towards it's photosynthesis capabilities but I'm very impressed with the quality and the fan is quite. The spectrum blend is insane! As the Gary stated, the light wont last.. I have a 360we paperweight right now.. its 2yrs old id say.. i bought mine from a local fish store.. i cant find the receipt.. kessil customer support doesnt care..
was great when it worked.. if your gonna spend 400 bucks for one fixture i highly recommend looking elsewhere..